Writing blog is one thing but writing a blog post that converts your readers into customers is totally another thing. You can write loads of blogs and keep hitting that publish button, but if you think that doing that is all that is required and rest will happen automatically, then I have to burst that bubble for you. There is a lot more than that you need to do. Well, converting a reader is your end goal or the action you want your user to take. Although it is highly perceived, it does not necessarily mean selling a service or a product. Conversion can be anything like getting a subscriber, making the user download your ultimate guide, or even informing them about service. So before you write your blog, you need to understand what is your end goal or as you may say, “the conversion”. Getting visitors is one thing but converting them into customers is where the real job comes in. First and the foremost thing that you need to do is identifying your audience. Every blog topic will have its own targeted audience, and thus the content of the blog will depend on it. Before starting to write, step back and take a moment to understand the targeted reader profile. What kind of market you are targeting? What is the demographic, age, etc. of the targeted audience? Is there a specific problem they are facing? And how can you solve that? What is that thing that you can offer to your users to make them listen to you and in the longer run, listen to you? When you have the answer to all these questions, you can plan out your content and that too in a much better way. It is very important that you do your audience analysis and understands your industry beforehand. Do not just guess your targeted audience and rather do industry analysis. There are many tools available in the market that can help you in planning and looking at your content needs in a much more strategic manner. Some of the tools I have mentioned here. KeywordTool.io – This is a free tool that you can use to have a look at the keywords that are currently working and are getting most searches in the industry. This will help you in getting to your users with the medium of search engines. Quora – If you are looking for content that solves users problems, you can have a look at the questions that people are asking regarding the same topic or niche. You can try searching other niche specific forums and chatrooms for relevant queries and other things that the users are searching for. 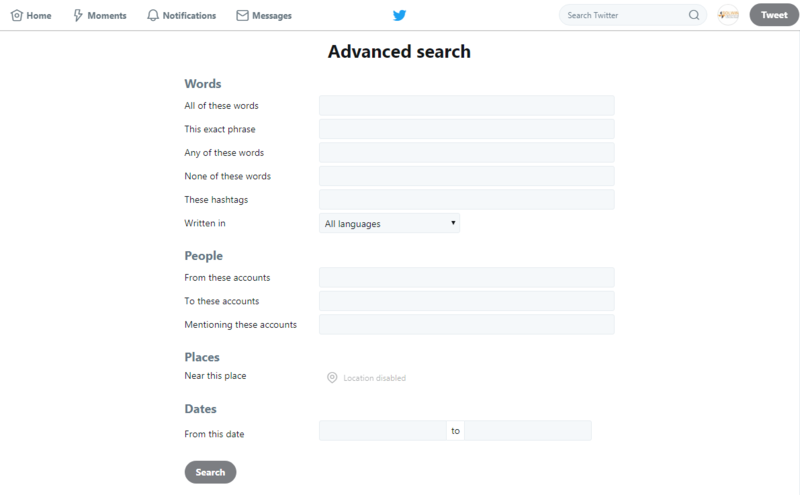 Twitter Advanced Search – This tool will give you the relevant questions that people are asking the keyword you feed in. Just type in your keyword and change the filter option to “questions” and it will display you all the questions people are asking in your specific industry. This can help you in planning your future blogs and content. There are other tools as well such as SEM Rush which helps you in understanding your competitor’s behavior and even give you the insights of your competitor’s strategies, and further you can devise your blogs by what is working in the industry. All this needs to be done and plays a crucial part in content planning. If you already have visitors, you can understand their behavior using Google analytics and further understand your user’s performance and how things can be improved to make them stay longer. Bad content is worth nothing. If you keep on publishing mediocre content, then you cannot expect a lot of retaining users. You might be able to pull visitors, but the falling retention rate will speak for itself. And this is not just it. If you keep on publishing bad content, you will end up annoying your visitors and driving them away. This will also result in increasing your bounce rate and changing your search engine performance. So, we know that we need to work on the content but how to do it is still a question. Let’s understand each part one by one. The title is the first part of the information that your users see and looking at the competition, you need to give it a lot of attention to make your reader want to know further. Many time bloggers focus more on the titles and make them cater to the needs of the “bots” which makes the headlines a little awkward, but it does make them rank on search engines. This is done while having the ideology that if your users are not even able to see your blogs, how are they able to read it. Well, it is true but having a too much search engine optimized title will give away the essence of personalization and can make your blog look a little awkward as mentioned before. So, should you go for headline keyword optimization or not? Well, I would suggest considering the search engine factor but do not let it take over the essence of the blog title. Maintain the balance between the optimization and the catchiness of the headline. For example, instead of going with “How to dress up for a party” go with something like “Party dress ideas that will make you stand out of the crowd!”. I am sure you can feel the difference between these two. Another thing that entertains the users is the Clickbait. Clickbait is something that is added to the title that makes the user irresistible to read the blog. It is sometimes considered as a bad practice but including click baits in content in moderation can help you boost your viewership. But when including click baits, you need to add the relevant content for the clickbait. When using click baits, do not mislead your users into something that you cannot deliver or will eventually disappoint your users. Do focus on your headline and make it attractive and catchy at the same time. The title is good enough to hook your target in, but if you want to retain your users, you need to have a good opener. The opener can have anything that will be interesting to your readers but make sure it does its job. The lede is something that will retain your users to read the full article. If your lede can inform your readers about what your article is going to be about, while using easy vocabulary and grammar that makes sense, then you have a perfect lede for your article or blog post. This is crucial as if your users are not able to understand what the article is going to be about in the beginning then there is a very good chance that the user might not even read the article. This is simply because the users did not understand the gist of what you will be talking about in the article. It is also important that you also take your users’ attention span into consideration when writing your lede. If you take too long to introduce the topic that you will talk about in the blog, then it still is not practical and will harm your blog’s readership. Remember to make it small and to the point with little vocabulary and perfect grammar. The title and lede only make it up to a little, although there is no debate it is important, it does not make up the whole article. You can have a really good title, and a good lede as well but if you have nothing to offer in your blog post, you would have a hard time making it conversion optimized. How to make the body of your blog interesting? Well, the first thing you need to do here is to plan your content. Do not start writing your blog without any pre-planning. Step back and think what your blog is going to be like. What topic you are going to talk about. How can you make it interesting and what is the best way to do it? There is a well-established fact that people always prefer stories over facts. Looking at the irony of the statement, it makes more sense to accept that we as humans have been hardcoded to respond better to stories than facts. Similarly, people care more about stories and what happens next. This is crucial information that can be used to make blogs interesting as well. Buffer team did a test to settle the debate if the storytelling works or not. They ran an article which opened with a story that blended into the content and another version which had a “traditional fancy intro” that immediately started out with the content. They analyzed the performance of both the blogs and this was the result. 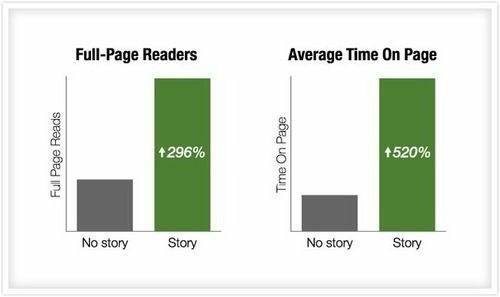 The version of the blog with a storyline resulted in 296% more people reading to the end and the average time spend the user exceeded five times that of the previous one. This does make the storytelling a crucial part of blogs, but this does not apply just to blogs. Storytelling has been an important aspect of our history. Even when we were growing up, tales taught us the lessons that were hard for us to understand. Stories also work because when we hear or read stories, our brain actually experience the situation or story as though we are experiencing the story firsthand. This makes us want to know more and more about it and leads us to the end of the story or here in our case, the end of the blog. Do remember that you are just using storytelling as a way to communicate your message and not specifically writing a novel. Your story must have a beginning, a middle, and an end but since we are blogging, we need to add plenty of subheadings, pull quotes, bullet points, and other visual data. Why? Well, the readers do not go with a blog as they would have gone with a novel, they skip, skim and scan. Make sure your story is easy to understand for scanners, and they are able to grab the message of the story as well. If your headline has the hook and the blog post is compelling enough to read them to the last, it will be of no use if you do not ask them to act. The act that we are referring here is the action that you want your user to take. Whatever your CTA (Call to Action) is, you must include it at the end of the blog. This will determine the future action of your reader. Although, it may not seem like a biggie, adding well crafted CTA has always yielded better results than those that don’t. Do not consider writing your CTA a very big deal or some tricky or terrifying thing. Just focus on the thing that your user wants out of it rather than providing generic CTAs such as Submit your email, buy now, etc. Easy to understand – The CTA should be made clear to the user. Try to add the CTA which will take minimal efforts from the readers. For example, instead of going for the 40 question long survey, go for a shorter one which can be followed with multiple weekly follow-ups with additional questions. Related to the blog post – You should give proper attention to the fact that your CTA should make sense to the reader. You cannot ask your users to download an ebook such as “Ultimate Guide to Travel Vlogging” after a blog which talks about “Impressive Food Recipes”. These were all the parts of a blog and how they can be made better. There are other things as well which you need to take care of. Sources and references are very vital when it comes to stating factual information in your blog. We as humans tend to believe more to things that have a factual backing up of the data rather than just dull stating of facts with no concrete support. Although, if you are not making any concrete statements and are talking about your experiences, you need not cite any sources or provide any statistics. If you are not providing statements and citing any proof, you will have a hard time convincing your readers and forget about converting them into returning visitors and converting them to customers. If you simply keep on adding statements and claims without backing up your information, you will also lose credibility and will raise suspicion in user’s mind, and that is something that we don’t want at all. A blog post only converts when the users read your blog. Obviously. But to feed so many words and information to the users is quite a difficult task, considering the falling attention span in millennials as well as the overall users. Having only text will not do justice to your blog and will end up in repelling the readers with a load of nonappealing text which can kill the interest of the reader, but there is a well-proven way to fix that. Even that same way is being used in this blog as well. The way I am talking about is with the use of visual aids. Adding images, infographics, videos, and other impressive visual parts to a blog helps a lot in retaining the user’s interest. You can get really good images from free image sources such as Pixabay and Unsplash. There are other good sources for other media type as well which you can add to your blogs. Regarding testing, you can check the average time a user stays on your blog and you can read the blog for the same duration and see at which part the user loses interest and can try to add some interesting visuals and graphics. SEO is something that no matter how hard you try to avoid it, you will eventually need to take care of that. You do not need to do incorporate too technical SEO techniques on your blog rather if you give little efforts on your blog, you will be good to go. The good part about this is that you can do it while you are writing your blog post. The method I am talking about is “On-Page SEO”. Below are the tips that you can incorporate on your WordPress blog. Keep in mind that your SEO needs to be taken care of. No matter how good posts you are writing, if you are not able to rank your posts on Google or any other search engine, you will have a hard time getting viewers, and fewer readers mean less conversion. To avoid that, make sure your posts are ranking on Google, and a single way to make sure that is happening is with the help of taking care of your SEO. All these solutions will bring more traffic to your website and will increase the conversion rate of your blog posts. Whether it be SEO or content optimization, all these tricks have proven to work for most of the businesses who are trying to increase conversion on their blog posts. While other blogging tips are surely effective but one of the most important of the lot is the Content Curation. Give more importance to your content on your blog post. Do not rush to hit that publish button, rather give more time to revise your content and make it better. Do not forget about your content once it is published. You need to do regular revisions and update the content once you are done with it. This will add to your SEO as well. Do not forget to add little eye candies to your blogs such as images, videos or any other good-looking content parts which will help you in keeping your users engaged. Let us know which tip you thought is most interesting and which one you would like to add to your website. Do you think there is another trick that can be used which can be added to this blog about how to write a blog that converts? Comment it down below!